Are people who believe in one or more Gods more likely to remain less intelligent than non-believers? 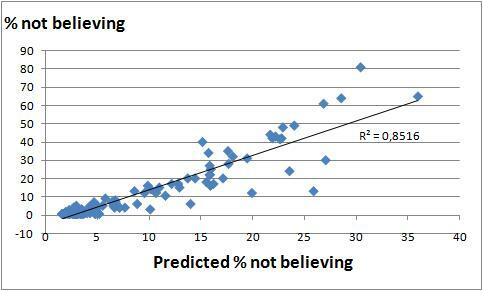 Are intelligent people more likely to lose their faith (if they ever had any)? Is there some other factor which causes people to believe in God AND be less intelligent ? quid freedom of press level ? And last but not least : what is IQ ? how is this measured ? So there would be a lot of work to do to investigate all this. Unfortunately I do not have the time to include all the above factors in an analysis for this blog post. But just to give an idea I of what it could give, I added the gross domestic product (GDP) per capita. So does this explains something ? 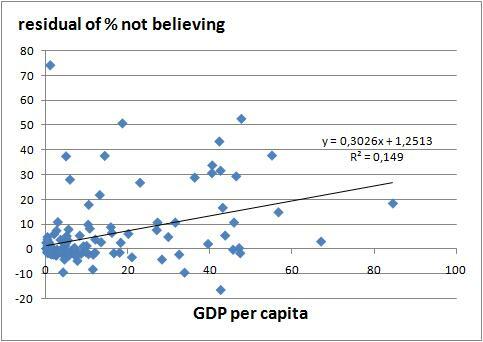 Only that % non-believers, IQ, and GDP per capita show concurring trends among countries. All three move in the same direction. 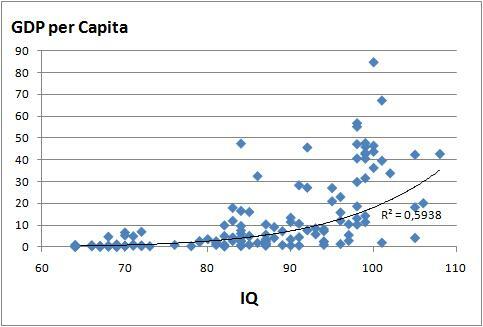 Take for example the relationship between GDP per capita and IQ. What can we learn from this ? Does this mean that if you increase the GDP per capita, the IQ will follow ? Or does it mean that the IQ-tests measure the extend to which someone is adapted to the life of the rich countries ? This would lead us to a discussion about the validity of IQ-tests. But that is a totally different story. To continue the discussion if religion is something for stupid people. Is it not so that people who believe in some God can support on their belief to cope with the problems in life ? Is that not one of the reasons that natural selection has favored religion ? So from that point of view it is relatively stupid not to firmly believe in your God. One last remark : It would be interesting to do the math with data about people who live in similar (wealth) circumstances, who had the same education. I think it is irrelevant to compare countries as different as France or Mali on this subject. « When is it OK to kill people ? That was a ridiculous conclusion. 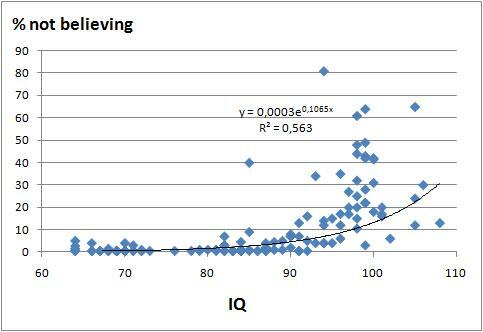 Your graphs clearly show that only stupid people with low iQs believe in god. And your conclusion is that this is why people must believe in god. You have all the right to find me an idiot. Everyone is entitled to form his own opinion. But then it leaves me with a paradox : How do you explain that an idiot like me does not believe in god ? And that some people I know, who are a lot smarter than me, are strong believers ? Or that some 100 years or more ago about everyone believed in some god. Was everyone stupid ? I don’t think so. As is stated in a lot of statistical writings : correlation is NOT causation. The only way to prove causation is to perform some sort of scientific testing.